We have been really busy lately, but this weekend we were able to kick back and relax, and for me, that meant spending most of my time in the kitchen. Once I started, I couldn’t stop. It was so much fun. Josh was a good sport too-he helped me create some fabulous recipes and did a lot of dishes:) One of my favorite creations was the lemon orzo salad we made on Saturday for lunch. Orzo is a pasta that is similar to rice in shape, but a little thicker and larger. I love making pasta salads with it. Even though it was cold and snowy outside, I was in the mood for fresh, healthy, spring foods. I incorporated lemon, asparagus, and spinach-ingredients that scream spring to me. I sprinkled feta cheese on top of the salad and it was the perfect touch. This salad is simple and fresh. 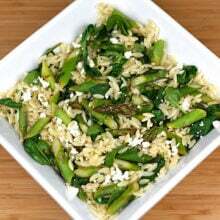 I loved the crunchy asparagus with the tender, lemony orzo. The spinach added additional green goodness too. Make this salad for a light lunch or serve it as a side dish to any spring meal. You will be amazed by how easy it is to make and how delicious it is to eat. On a side note, who is watching the big game tonight? We are. I think I might cheer for the under dogs, Butler, but I have a feeling Duke will win. Josh is making his famous hot wings. Should be a fun game. In a medium sauce pan, bring 4 cups of water to boil. Add the salt. Stir in orzo. Cook until tender, about 10 minutes. Drain orzo and set aside. In a small sauce pan, saute garlic in olive oil. Add in asparagus pieces. Saute for 3-4 minutes. Stir in spinach. Cook until asparagus is tender and the spinach shrinks down. Put the orzo in a medium bowl and add in the vegetables. Squeeze fresh lemon juice over the orzo and vegetables. Stir. Season with salt and pepper. Taste-add more lemon juice if you wish. The lemon I used was huge, so I only needed to use one lemon. If you need more juice, go ahead. awesome awesome awesome! This looks so fresh and delicious! Love the flavors! That does look really good – and you know I love orzo for salads. We can’t harvest from our plants for two more years, but there is some nice asparagus coming into the stores right now – yum! This sounds amazing!! I think Duke is going to win, but I’d like to see Butler pull it off!! Now that is a fantastic looking spring salad! That looks like a good spring meal. Sounds wonderful! I bet it would be great with some tuna as well, if you wanted to add a protein. I love when asparagus is in season! Beautiful salad! Wow…LOVE orzo, love these ingredients! This is a MUST MAKE! YUMMY Maria! I could use a nice plate of this today!! Delicious sounding salad and perfect for a warm weather meal! I LOVE Orzo. This looks like a great Spring dinner. I could eat this for dinner & be a happy camper. Beautiful! I made your Roasted Asparagus recipe over the weekend and it was awesome! My family loved it! I have some leftover asparagus and this looks like a perfect way to use it up!! Happy Easter! This sounds delicious!!! I have some beautiful asparagus waiting for me to come up with something. Love it! This is such a light and flavorful dish – nicely done. this looks so perfect for spring. i can just tell that all of these texture really play well of each other. i’d love to serve this as a side next to a great grilled steak, salmon or chicken! Sending myself this recipe right now, can’t WAIT to try! Looks amazing, I love asparagus. This looks super yummy! Can’t wait to be outta the dorm so I can make this in my very own kitchen! This looks so fresh and delicious, Maria! We’re definitely cheering for Butler tonight – I’m a sucker for the underdog. This dish is perfection. I love every single component! we just had a dish very similar to this last week, with lemon, a little tumeric and cumin. I will definitely try this version, asparagus is rampant! What a lovely springtime recipe. 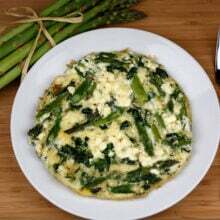 I love the combination of asparagus, spinach, lemon and feta! I think I will try this tonight. It looks like a delicious little salad. This is a great dish! I have saved the recipe to use when I have company sometime this spring! How pretty too! Thanks! Looks great and perfectly healthy! A weekend filled with cooking sounds ideal to me! I love the seasonal flavors of this salad. I have been so enamored with asparagus lately and can’t get enough ideas for using it up! this is gorgeous maria! pure spring on a plate! it looks so clean and healthy too! Looks perfect Maria! 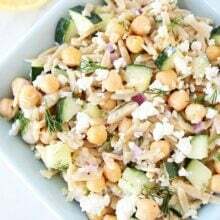 I have always loved orzo and I think it’s great in salads. We don’t have snow here but cold temps and lots of rain and I am so ready for spring! Guess I’ll just have to have it in salad form. This looks so fresh and satisfying. A perfect salad for a picnic too. What a beautiful Spring salad. I love orzo flavored with lemon! What a cheerful combination of spring time delights! yum! so simple, so perfect for spring! adding this to my to-make list! Great combination of ingredients Maria – I love all of them! This would be a wonderful side. This looks perfect for spring! You were so right in your comment on our blog: you sure do eat tasty vegetarian dishes! 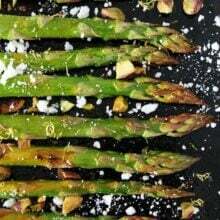 We actually posted today asking for submittals of asparagus images so we can do a spring roundup of them and link back to everyones sites and recipes: would love if you’d like to include yours! Wow, I love this. I might have to make it, subbing something like quinoa for the orzo (haven’t found a gluten-free orzo that I know of yet!) and serve it at my sister’s baby shower! It’s so perfectly spring, fresh, and yummy-looking! And sorry, I’ll be cheering for Duke tonight! Go Blue Devils! I’m a rooter for the underdogs myself! what a bright and spring-appropriate salad, maria–this must’ve been such a pleasure to eat! I can’t get enough asparagus!!! this screams spring, instantly making me happy and hungry! This sounds really good. I’m on a quest to find whole wheat orzo in Salt Lake, but haven’t found it yet. Kalyn-if you find the whole wheat orzo, please let me know. I will be on the look out. If I find some, you will be the first to know. Love orzo and all these yummy flavors you’ve put together here. Sounds (and looks) delicious. Yum! Orzo and Feta with lemon?? Please pass some this way! I haven’t had orzo in a while. This is lovely in every way, and makes me want to purchase orzo right away. This is seriously the recipe i’ve been looking for! i have orzo sitting in the pantry and I couldn’t think of what to do with it. I just bought beautiful asparagus from the farmer’s market so perfect! It is like you read my mind 🙂 Thanks for this post! Orzo salad is so good but orzo with spring veggies is even better! Lovely pictures to boot! BTW – I have seen whole wheat orzo at Costco in my area so you might want to check! Oh, what a great salad. I have all the ingredients, this is coming to my house tomorrow. Duke won a close one, didn’t they? This has some of my most favorite ingredients! This is so pretty and spring like. yum! This looks so fresh and Springy! I love the touch of feta over the top to bring it all together, too. A delicious and fresh looking dish! 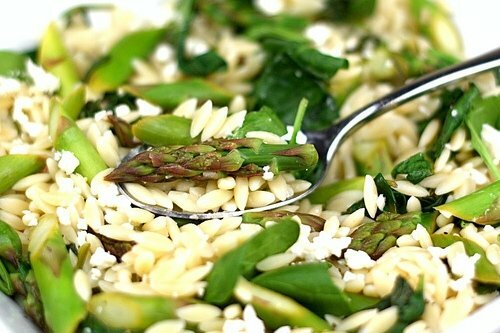 A definite bookmark here….I recently tried orzo and love it AND we LOVE asparagus in our house! Looks so good. I love orzo. Have you ever found whole wheat orzo? You know, I’ve never been a big fan of orzo, but this recipe is making me reconsider. It sounds delicious! Cathy-I hope you liked the baked zucchini fries! We are finally having spring weather so this recipe comes at the perfect time to use all those great spring veggies! 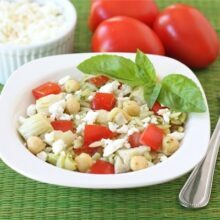 I love making salads with Orzo! This recipe looks great – such a great way to use my favorite spring ingredient (asparagus). First time here at your blog. Love orzo and yours sounds delicious with all my favourite ingredients and flavours. This was a wonderful dinner last night! I’d actually double the spinach and add more asparagus. Yours looks a lot greener than mine…maybe my asparagus were smaller or something. This looks DIVINE. You combined two of my loves–orzo and lemon. PERFECTION! Maria – this looks so good! I’ll have to make it for a work lunch one of these days! I just made this tonight and it was the perfect summery dinner. It was light but filling. Plus, fat-free feta made this even healthier – but didn’t dull the flavor! Erin-glad you enjoyed the salad. Great idea to use fat free feta! What a lovely salad… I love lemon and asparagus. Some of my favorite spring flavors! So beautifully full of spring flavors! 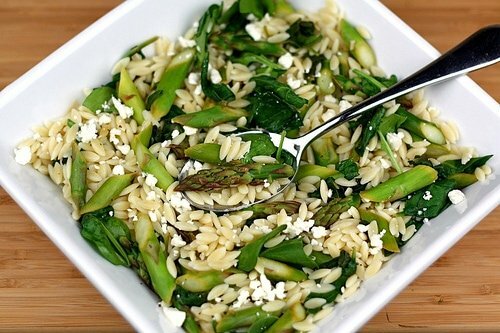 This looks really delicious and refreshing…I also like the green colors of the asparagus and spinach paired with the Orzo and Feta cheese. This looks like the perfect spring pasta dish! Thanks for sharing! This is right up the middle of my alley for sure. I am on an aspargus kick lately too!!! Love orzo…….. I made this last night for our cooking club- i added sauteed red onions though. Everyone loved it. Looks delicious! So springy – I can’t wait to make it! Love it — I’ve done a spinach-only variation for years (with pine nuts although who can afford $28/pound non-Chinese pine nuts anymore?) but I love the idea of adding asparagus! I love making orzo salads. This is a good one. Hi, I discovered your site from Pioneer Woman, and I have to tell you that I tried this recipe and LOVED it! Anything lemony is alright with me, and this was perfect. I cooked my orzo in chicken stock but only because I had some extra and wanted to use it and switched arugula for the spinach because that’s what I had. I will definitely be making this again soon in the near future! Thanks for the recipe! Easy and delicious! I could eat the whole thing! I tried this recipe when I saw it on Tasty Kitchen. Only, I had roasted asparagus. It was delicious! Such a great combination. I can’t stop eating this. Although I confess I had no orzo, so I used quinoa instead. Which is good, because every time I try to eat quinoa I end up finishing what I’ve served myself only because I don’t want to waste it and not because I enjoy it. I can’t wait to eat some more tomorrow. We are obsessed with this recipe. So delicious as a side with simple grilled lemon chicken. We have made it 4 times in two weeks! Thank you for such a healthy, easy to prepare dish! Made for dinner tonight. I liked it, but different for kids. I made this for dinner tonight after my 4.5 mile run and it is AMAZING! I love all the flavors. I am a HUGE fan of Asparagus, so when I saw this recipe, I automatically went out for the supplies today. I loved every bit and I have leftovers for lunch! Cooked this tonight with some whole wheat Orzo from Fresh Market — SOOOOO DELICIOUS and QUICK! Thanks for sharing. Look forward to trying more of your recipes!! I made this salad last night. I added some quartered grape tomatoes, caramelized onions and sliced steak to make it a meal instead of side dish. IT WAS AWESOME!! I served it cold instead of warm. Had the first almost spring-like day in the Northeast after a looooooong winter, and we decided to grill a chicken in garlic and white wine. This was the perfect side. Thanks for sharing! I think this will be a well-used recipe. Any substitution suggestions for the Feta Cheese? I’m just not a fan of it, everything else looks great though. You can leave it out or use Parmesan or goat cheese. Made this salad for the weekend and it was a hit in my house! Thank you. Made this salad last night and it is delicious! My husband took some leftovers to work and is still commenting on how good it is. Thanks for the recipe! yes, it is a good topic. I learned many things from it! This dish has become a staple in my home. My husband and I absolutely love it. In fact, making it again tonight. We both prefer it cold. The only thing I add to your perfect recipe is a handful of peptic seeds. Gives it a nice texture here and there, and adds some protein. Lovely recipe that turns out perfect every time I make it. I prepared this recently and found that I had way too much orzo and not enough veggies to my liking. I ended up sauteing more veggies so they were doubled and the proportions seem much better. Not sure where I went wrong, but with more veggies it was delicious. I used 1.5 med sized lemons. This is such a nice, fresh dish. I love it! I doubled or tripled the spinach and added toasted pine nuts for a crunch. I think you could also add some diced chicken for some protein or to make it more of a main dish. I feel like there’s so much you can do with this as a base. I substituted ramps for garlic and spinach–very delicious. Sooooo good & VERY EASY!! A perfect summer meal or side dish! Love the lemon…very refreshing!! This will be definitely be a new favorite summer dish!! Thank you! !